What is the difference between Power and Pressure Washers? Power and pressure washers have the same function, power ranges, composition, and build. The only distinguishing factor between the two is the additional heating component found in a power washer. With the built-in heater, a power washer is capable of delivering a powerful stream of hot water. Hot water is very effective for removing a large build up of dirt and grime. It is also effective for cleaning out surfaces laden with oil and grease. Just like a pressure washer, power washers can also be used for every day chores such as cleaning walls, decks, pavements, and patios. There is really nothing the other can’t do. Power washers are only a little bit more advantageous because of the additional heater. However, it also has its own drawbacks, which will be further discussed in this article. How does a power washer compare with a pressure washer? Although there are very minimal differences between the two, there are some distinguishable factors that you should consider before deciding which one is the best to get based on your needs. Essentially, power washers are created with more power to complement the additional heat. Otherwise, it would defeat the purpose of adding a heater if the water pressure is not as strong. The cleaning power will become lesser and you’d be better off just investing in a normal pressure washer. Although there are lightweight psi ranges for power washers, it usually comes with lesser heating temperature. If this is the case, you can just save yourself some cash and buy a pressure washer that has a medium psi power. In the long run, a normal pressure washer is cheaper and more convenient. There are also a lot more choices for pressure washers compared to power washers. You can pick from a variety of brands and models for lightweight, medium, and heavy duty. In the case of power washers, most of them are in the medium and heavy-duty range, which is not that practical if it is intended for home use. Do you really need heated water? Heat is great for breaking down buildup of dirt, mold, and mildew. It is also good for removing chewing gum, sticky stuff on surfaces, grease, and oil. Even a strong current of water might take some time removing all the stuff listed above. If you’re going to deal with these kind of a stuff a lot, considering getting a power washer as the cleaning will be faster and more effective. Most power washers have a temperature range between 100F to 250F. Keep in mind, that the hotter the water can get, the larger the heating coil installed in your power washer. The larger the heating coil, the bigger and heavier it is and the more fuel it consumes. It has a maximum temperature of 250F. Power washers are also more expensive than pressure washers. Good pressure washers with decent psi power only range from $200 to $400 while heavy-duty power washers range from $1,000 to $2,500. If you compare the two, both can do really strenuous cleaning but without the heated water in the case of pressure washers. 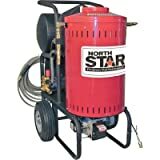 Is a “normal” pressure washer that has a strong power at 2,800 psi. This is considered as a residential pressure washer, but it is quite strong that it can also double as a commercial pressure washer. For this power washer, you’ll get only a power of 1,200 psi. However, the water is heated and can go up to 100F temperature. 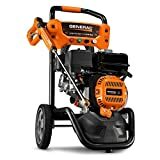 The Generac is no doubt stronger and it is also cheaper. Simpson mini-brute is more expensive and can deliver less strong current. Ask yourself if opting to have an additional heater is worth the $1,500 difference you have to pay. Which consumes the least fuel/electricity? Most power washers require both the need for electric and fuel consumption. For instance, the Simpson Mini-Brute needs electric power for the motor and diesel fuel for the fired burner. Because it has two sources of power, it is more costly. Pressure washers, on the other hand, only need either electric or gas. This one is relatively smaller than the ones listed above, also due to the fact that it doesn’t have a built-in fuel tank for the heater. When it comes to overall portability, no matter the power, fuel use, or composition, what really wins this round is the pressure washer because it’s more straightforward. It is composed of only the motor, pump, and the spray. These components are usually housed in a metal enclosure with wheels for easier mobility. Because of its lesser components, pressure washers are also lighter. Key Takeaway: For overall function, portability, price, and consumption, the normal pressure washer wins easily. This is because pressure washers are not only cheaper, but they’re also easier to take anywhere you go and they don’t consume too much fuel/electricity. There are also more brands and models to choose from. If you can live with a pressure washer without heat, then go for it. There is only one difference when it comes to the cleaning capacity of pressure and power washer. It is the additional heat that power washers can generate because of its built-in coil heaters. The result is a strong stream of heated water that is more effective for cleaning. However, it is more expensive, it is larger, and consumes a lot of electricity. If you have absolutely no need for heat, skip a power washer.